Explanation: Adrift in a cosmic sea of stars and glowing gas the delicate, floating apparition left of center in this widefield view is cataloged as NGC 7635, the Bubble Nebula. 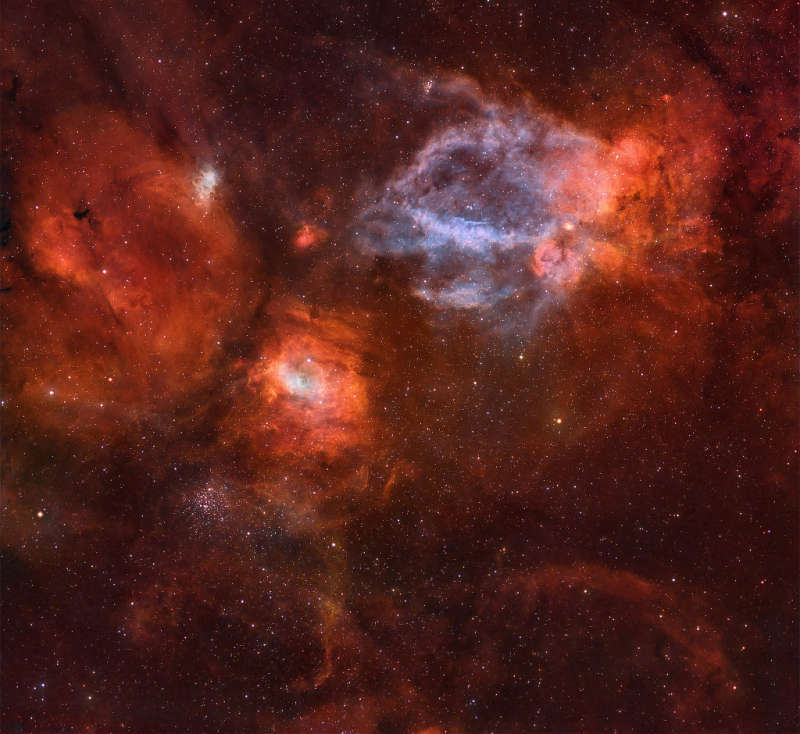 A mere 10 light-years wide, the tiny Bubble Nebula was blown by the winds of a massive star. It lies within a larger complex of interstellar gas and dust clouds found about 11,000 light-years distant, straddling the boundary between the parental constellations Cepheus and Cassiopeia. Included in the breathtaking vista is open star cluster M52 (lower left), some 5,000 light-years away. Above and right of the Bubble Nebula is an emission region identified as Sh2-157, also known as the Claw Nebula. Constructed from 47 hours of narrow-band and broad-band exposures, this image spans about 3 degrees on the sky. That corresponds to a width of 500 light-years at the estimated distance of the Bubble Nebula.